Having penned over 400 songs, Carole King is credited as one of the major songwriters associated with the famed Brill Building of the 1960s. In her recent memoir, Carole King: A Natural Woman, however, King points out that Aldon Music, the publishing company where she produced many hits, was actually located at 1650 Broadway; the Brill Building was a block away. Regardless of the physical location, there is no doubt King contributed to the timeless “Brill Building sound.” Several sheets of music that she wrote are currently on view at NMWA in Women Who Rock. King, born Carol Joan Klein on February 9, 1942, in Brooklyn, NY, grew up drawn to the performing arts and music. As a toddler, she began her first music lesson with her mother at the family piano. At the age of 15, she was introduced to disc jockey and music promoter Alan Freed, who had coined the term “Rock and Roll.” Freed graciously listened to her songs and explained the process of attaining a song writing contract. King, confident in her ability, arrived unannounced at Atlantic Records, where she performed for Jerry Wexler & Ahmet Ertegun, two well-regarded A&R men in the music industry. While Wexler and Ertegun reacted positively, requesting that she return when she had more songs, it was ABC-Paramount that first offered King a contract—though it would be a few years before she would have her first chart-topping single. King and Goffin would supply Kirshner with a string of hits, including: “Will You Love Me Tomorrow” (the Shirelles), “Take Good Care of My Baby” (Bobby Vee), “The Loco-Motion” (Little Eva), “Chains” (the Cookies), “One Fine Day” (the Chiffons), “Crying in the Rain” (Everly Brothers), “I’m Into Something Good” (Herman’s Hermits), “Pleasant Valley Sunday” (the Monkees), and “(You Make Me Feel Like a) Natural Woman” written for and recorded by Aretha Franklin. 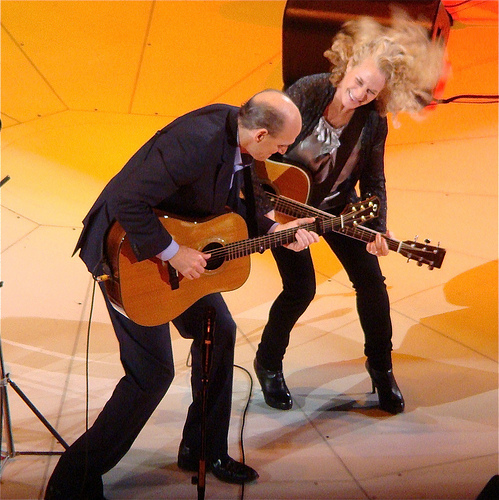 After nine years of marriage, Goffin and King divorced; King moved to Laurel Canyon, CA, where she collaborated with lyricist Toni Stern as well as close friend and fellow musician James Taylor. Inspired by Stern and encouraged by Taylor, King gained confidence to establish herself as an artist in her own right instead of remaining in the background as a writer, producer, and “sideman” where she felt most comfortable.1 In 1971, under Lou Alder’s label, Ode, King released the album Tapestry. With hits like “I Feel the Earth Move,” “So Far Away,” “You’ve Got a Friend” (which would become a #1 hit for James Taylor), and “It’s Too Late” (co-written by Toni Stern), Tapestry sold more than 25 million copies and remained at the #1 position on U.S. charts for 15 weeks. King was inducted into the Rock and Roll Hall of Fame in 1990, received a Hollywood Walk of Fame star on December 3, 2012, and will be the first woman awarded the Library of Congress Gershwin Prize for Popular Song. —Kathleen A. Kimlin is the new media marketing specialist at the National Museum of Women in the Arts. 1 Carole King. A Natural Woman: A Memoir. (New York: Grand Central Publishing, 2012) p. 204–5.